Our phones are always within reach. Always. And when they aren't, we tend to go into conniptions – a scenario that usually involves pulling out sofa cushions, opening desk drawers, and checking the car to see if we left it in the center console again. Thankfully, we don't lose our phones very often. We simply misplace them. But what if you really did lose your phone? iPhone users have the "Find my iPhone" app, which is free for iOS devices. BlackBerry, likewise, offers BlackBerry Protect, which is essentially the same thing. But what happens if you lose an Android phone? How will you find it? And what will happen if your phone falls into the wrong hands? Here are four simple ways to protect and secure your Android phone against the actions of wrongdoers. 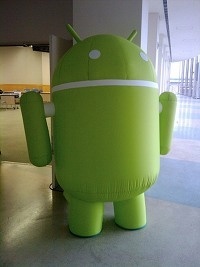 Much like their brethren in the Apple and RIM environments, most Android phones have a built-in GPS locator. You probably know it as the little blinking dot that shows where your car is on a map. And since there's a free app in the Android Market called "Where's My Droid?," finding your phone after you've realized it's missing ought to be a cinch. All you have to do is assign a secret "attention word" in the app's settings. Then whenever anyone texts that word to your phone, it will trigger a loud, resounding ring that you're sure to hear as long as your device is nearby. If it isn't, the phone will reply to your text with its precise GPS location, so you can go and pick it up. Download an advanced security appWhile "Where's My Droid?" might mitigate certain security issues by helping you find your phone before someone steals it, the app will not protect your data from theft. For that, you'll need a more advanced security solution. Apps like Prey, which works on multiple devices, allow you to track your phone's location, lock down your operating system, or even take a picture of the thief with your phone's camera. Prey is free to use on up to three devices. Other apps like McAfee's WaveSecure let you back up your data remotely and wipe it all from your device when necessary. Using these apps on your personal phone is analogous to corporate use of enterprise fraud prevention software that thwarts data thieves. It's just a precautionary measure – and it's one that could play a pivotal role in protecting your data from really bad people. Look for WaveSecure in the Android Market. It's not free, but can you really put a price on data security? Don't store passwordsLet's say I'm a criminal and I find your phone. You're using Mint.com to manage your finances (good on you! ), and you've made it easy to see your bank records just by opening the app. Now your personal financial data is at my disposal. Is that really what you wanted when you stored your password for better "convenience?" Probably not. Storing passwords leaves your device more vulnerable if it's stolen. Sure, it may take an additional 15 seconds to key in a password, but it's almost always worth it to require one before granting access to certain apps. If you have trouble remembering all your passwords, try an app like LastPass or 1Password that lets you access them more easily. And assign a passcode. Most thieves will be hard-pressed to get inside your phone and steal your data with a four-digit, graphical padlock standing in their way. Having a passcode is an easy way to protect you from harm. Not only that, but it will help put your mind at ease the next time you really do misplace your device. Adam Green is a freelance writer and Android enthusiast. He may grumble every time he has to enter a passcode on his phone, but he figures his security is worth the extra effort.